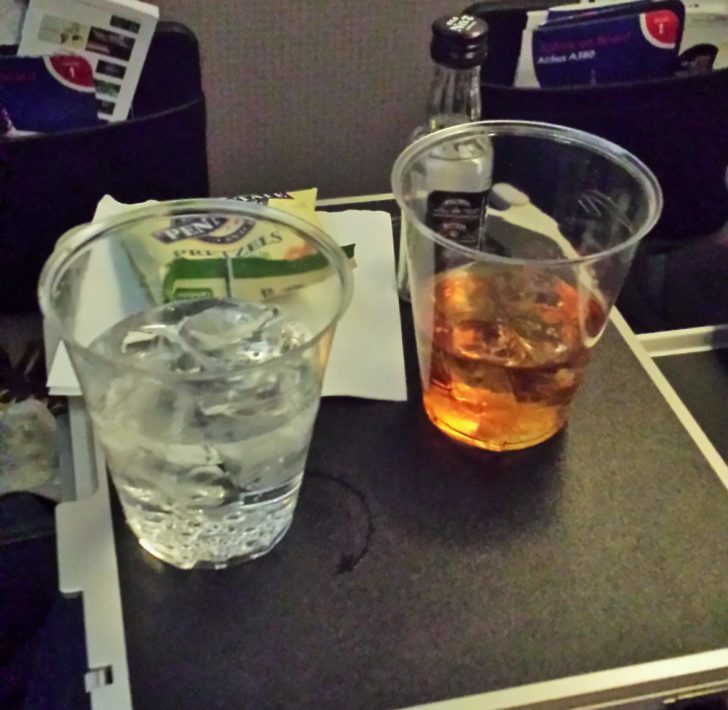 It has been almost four years since I have flown British Airways, with my last flight on them from London to Beijing back in January 2009, and I must say I was impressed with BA then and I am again extremely impressed by the airline! Although I did not receive a club world upgrade (business class) like I did on my last flight, I must say I was extremely comfortable in World Traveler Plus (economy plus) and probably would have been alright in economy class as well on the A380 aircraft. 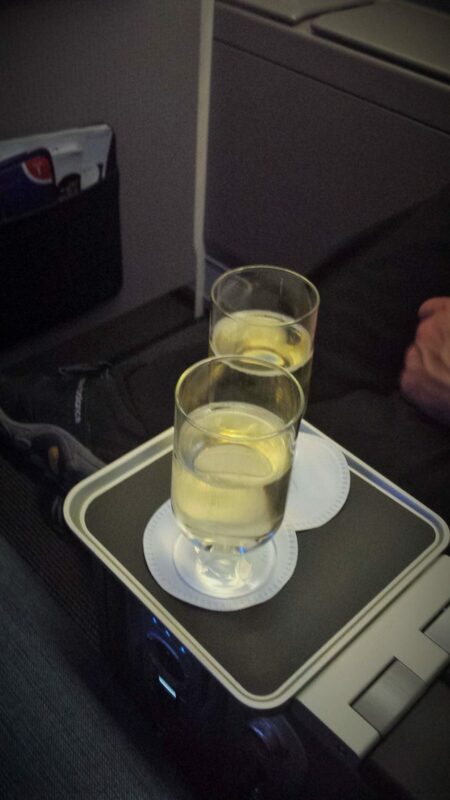 I do have memories of being smashed like a sardine last time I flew BA economy, but that was on the older 747-400. Despite this, my experience today was top notch and I can honestly say I am looking forward to flying BA again the near future. Despite being Sunday after Thanksgiving, TBIT at LAX was fairly quiet, but then again, I guess most people travel domestically for the holiday and not internationally. 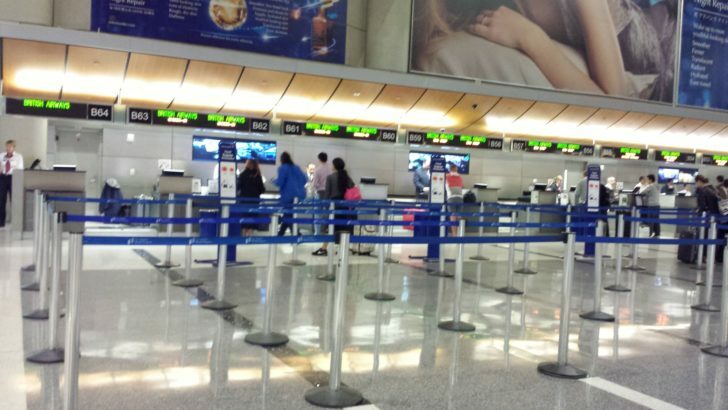 Despite this, when I arrived for my flight 1.5 hours before departure, the check in area was near empty. There were about 6 people in the business class line, but not a soul in line for Economy or First. Since I was traveling Economy Plus, I would have checked in with the business class passengers, but thought waiting in line would be silly so instead I opted for bypassing the line and checking in with the agent for economy class. The agent was real friendly and quickly checked me in and tagged my luggage. Before he printed my boarding pass I asked him if any of the bulkhead seats opened up as I was really hoping to have the extra leg room and make it easier for the person next to me to get up if they needed to while I was sleeping. To my luck, despite the seat map on BA.com displaying all bulkhead seats as occupied, 61J had actually opened up and the agent was happy to assign it to me. 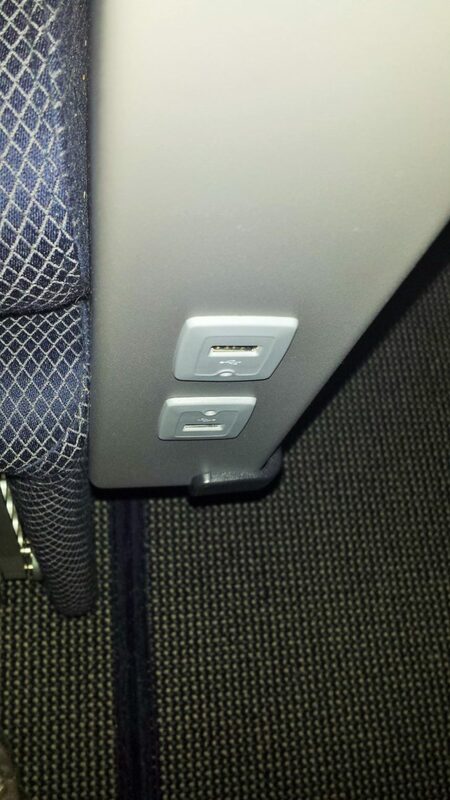 I then casually hinted about an upgrade to business class. The agent laughed and said those rarely happened, but they were having a special and it would only cost $900 to upgrade from World Traveler Plus to Club World; I smiled and declined the offer and worked my way towards security. To my surprise only 1 of the two security check points were open, so despite being directed to the Northern check point, TSA redirected me to the southern check point. There were only about 30 people a head of me, but the line moved at a snail’s pace. Clearly, these international travelers didn’t travel often and didn’t understand the rules of the road. One TSA agent had a microphone and in a Kentucky Derby Horse Racing announcer fashion, he directed people on what they could and could not bring through security, how to undress properly and more. I will honestly say it was my most enjoyable wait at security. When he was done with his rant, people in line actually applauded him and one woman recorded part of his speech because it was so humorous. I was glad to see that some TSA agents still have personalities! 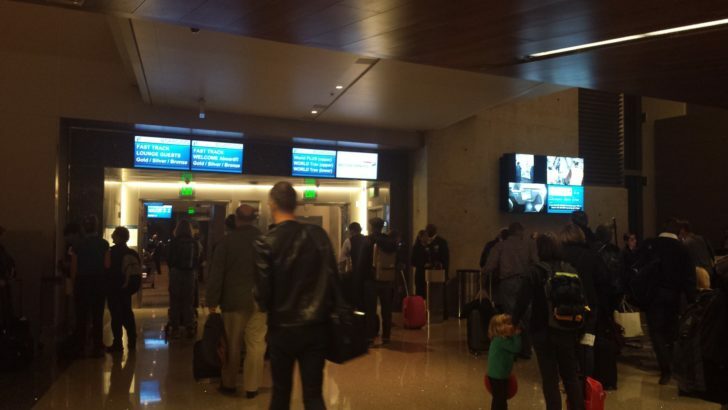 My status on AA is not nearly as high as it has been in the past and British Airways A380 Premium Economy passengers do not have access to the OneWorld lounge in TBIT. So instead, I headed over to the SkyTeam Korean Airlines Lounge. I had been to this lounge before, so I will not review it in detail. Thankfully this lounge is accessible via priority pass (which I have thanks to my American Express Platinum). 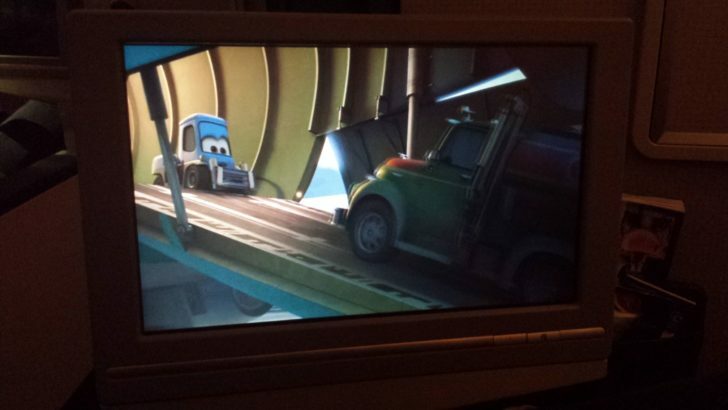 I will report that it appeared as though work was being done on it, so maybe we can expect an upgrade in the near future! I left the lounge about 45 minutes before my flight departure time, which allowed me to have a look at the newly remodeled TBIT. As I walked towards my gate, I was extremely impressed by the new shops and felt like for the first time ever LAX was finally on par with some other big International airports! The remodel was well worth the wait. By the time I reached the gate: first, business class, economy Plus and OneWorld Elite passengers were almost done boarding. I jumped in line hoping to snap a few photos before the cabin filled up. Sadly I was a bit late for this, but the boarding process was smooth. There were two large doors for people to go through and three agents scanning tickets while two others worked the gate and answered passenger’s questions. 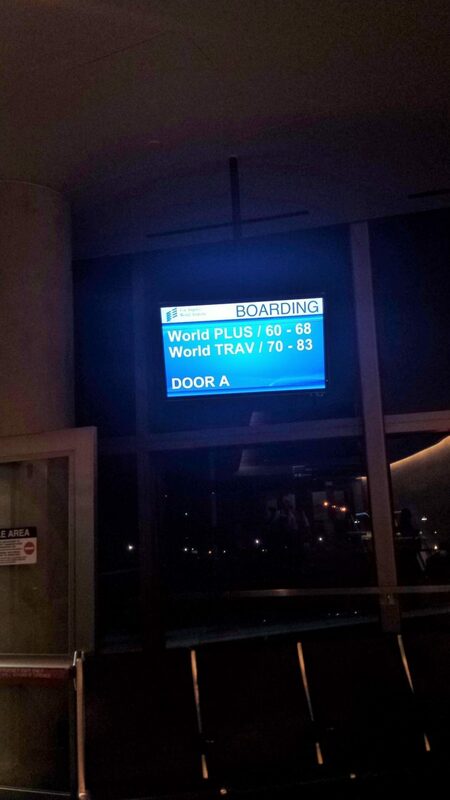 Since I was on the upper deck, I bypassed the first two doors and entered door c which landed me in the middle of the upper deck club world cabin. I quickly found my seat, made myself comfortable and allowed other passengers to pass me. During the entire boarding process, the IFE systems were on, so as I said my good byes, wrapped up last minute calls, and text messages, I was also able to play with the IFE system. This was nice, because it distracted people and kept them busy during the boarding process which can otherwise be boring. A few minutes later, after most passengers were boarded, an FA came through the cabin with glasses of orange juice, water, or champagne for all British Airways A380 Premium Economy passengers. It was a touch of Business class without the lay flat seat. Then, before take-off, dinner cards were distributed and we pushed back and took off towards London. As this flight took off around 9pm, the cabin crew was very quick about getting service started. We must have been barely at 15,000 feet when the FAs appeared in the aisles again handed out warm towels to every passenger in Economy plus, then minutes later a cart was in the aisle and drinks and pretzels were served. I opted for Bourbon on the rocks, which resulted in a mini bottle of jack and ice in a plastic cup. I guess the glassware was gone for now. Afterwards, dinner service began. 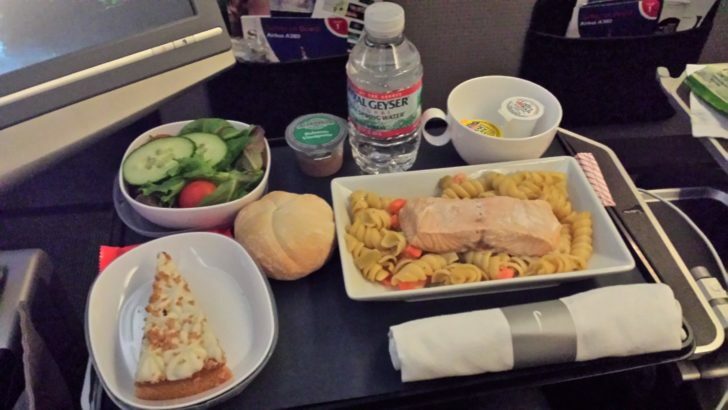 I had specially ordered a seafood meal because I am a pescotarian and was unsure if there would be seafood or meatless options in economy plus. My meal was served to me before everyone else and I was already ¾ of the way through my Salmon served on pasta before the food and drink cart reappeared. I ordered wine to go with my meal and was again served a plastic cup with my plastic bottle of wine; the wine, decent and paired well. After dinner, the FAs appeared in the aisles to clean up and I was still feeling hungry; after all I had only had one meal all day, so I politely asked if they had any vegetarian meals left. The sweet young FA told me she’d check and bring me one if so. Not even 5 minutes later, she reappeared with another full meal tray. 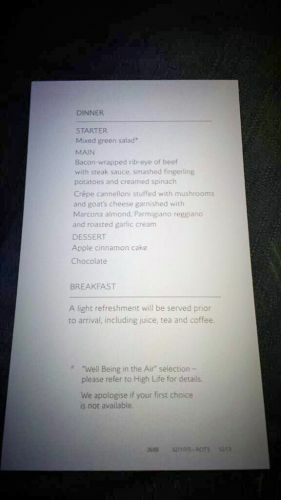 I thanked her and her response was “Of course dear, we have so much food on this aircraft! Please eat up!” Meanwhile, I felt like a fatty as I unwrapped my second meal. To my surprise though, instead of being the one listed on the menu this was actually a special vegetarian meal. 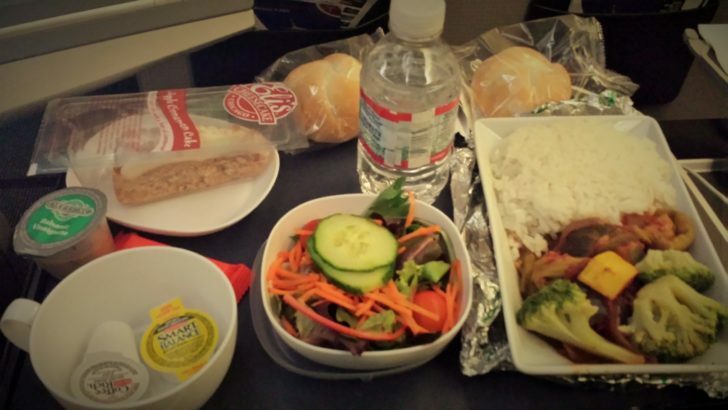 It was just vegetables in marinara sauce and rice, VERY similar to what I had on my united flight months ago to Hawaii! Clearly an LAX staple! I took one bite of it and thought to myself, despite being hungry, I really do not want to eat this trailer park goulash like meal. I don’t know if it was luck or if the FA knew the meal was no good, but not even 10 seconds after I took my first bite, she was standing alongside me holding a tray with another hot dish wrapped up. She told me it was the BA meal and from what she has been told it was better. I quickly traded her out and was delighted to eat the goat cheese crepes. They were so good I nearly licked the plate clean! 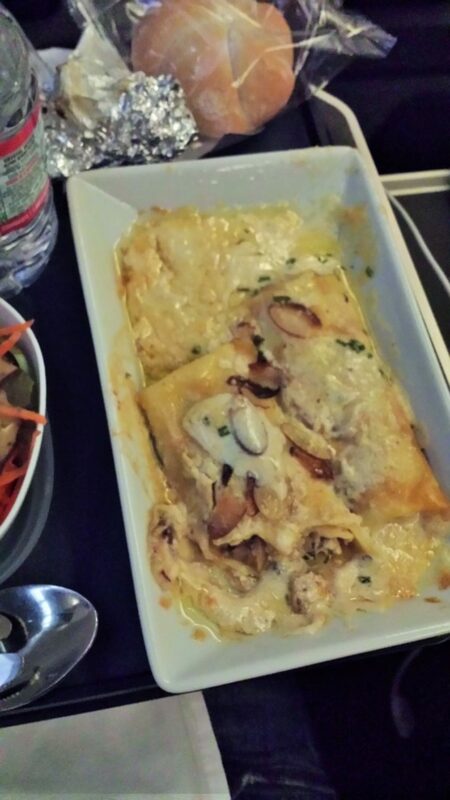 I admit it, I like (some) airplane food! Shortly after dinner, I returned to my zoning out while watching one of the hundreds of entertainment options on the IFE and before I knew it was I was waking up and it was breakfast time again! I slept for almost 7 hours in an upright seat! I was shocked! But either way, the seat was comfortable and I felt well rested! 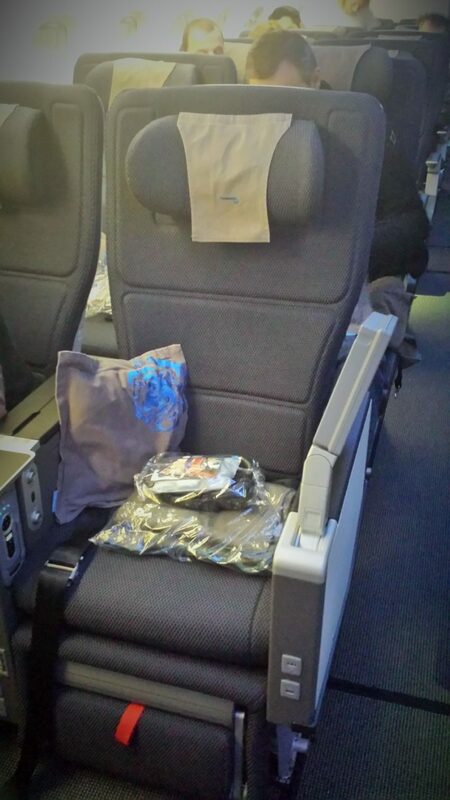 British Airways A380 Premium Economy is an awesome way to fly. As I said, shortly after I woke up, breakfast was served. 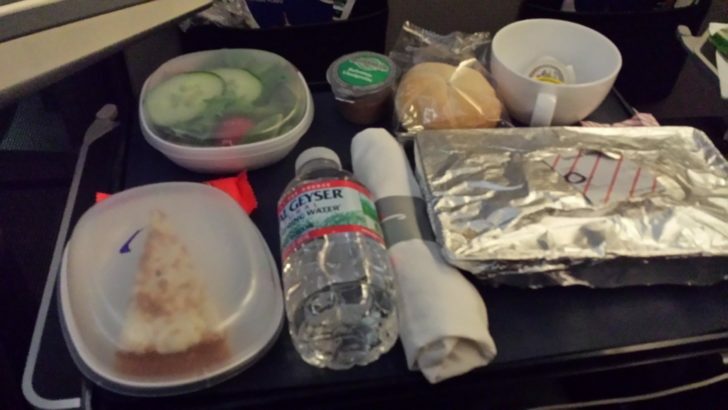 Again, because I had a special ordered meal I was served first and my meal box was delivered to my seat. I opened up the box to find a cold bread roll stuffed with Lox, an orange juice, and a yogurt. It was nothing special, but because I had ate so much for dinner I was still honestly still full. 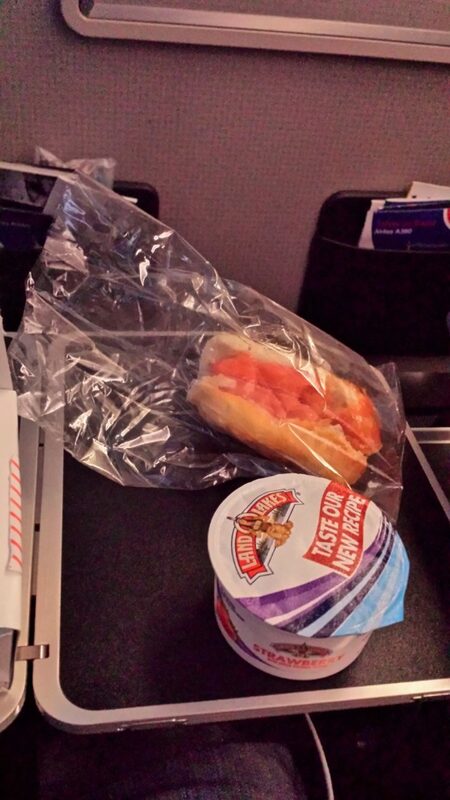 Not to mention it looked better than the bread roll and granola bar offered to the other passengers. 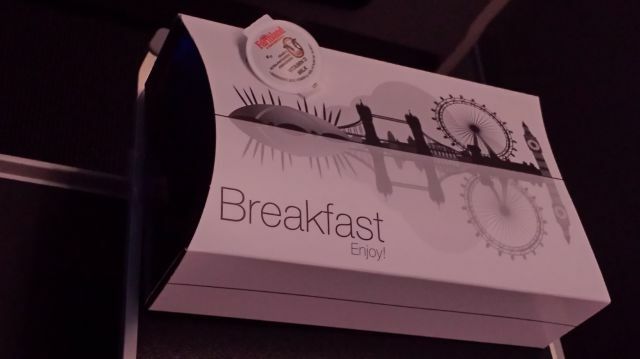 For such a long flight, the breakfast was a bit lacking in substance but it did the job. 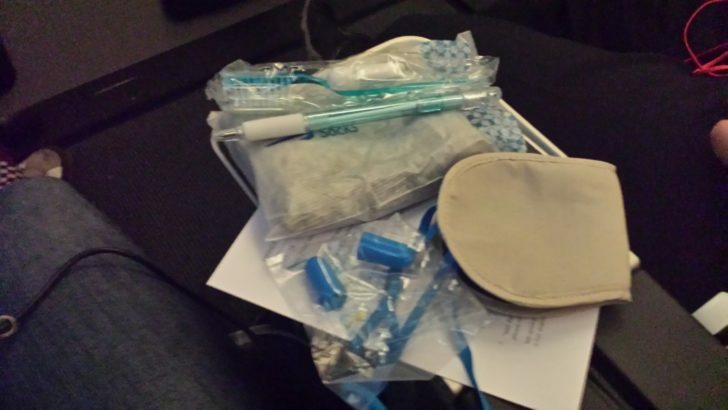 Amenities: A small amenity kit was on the seat when I boarded which was a ziplock style hard plastic bag with an eye mask, ear plug, tooth brush and paste, and socks in it. I used the socks and tooth brush but was able to sleep without the other two. It helps that they kept the lights dimmed the entire flight and that British Airways A380 Premium Economy cabin is extremely quiet. There is barely any engine noise! Each seat also had a blanket and a pillow on it. I used the pillow but never used my blanket as the plane was plenty warm. The pillow was a standard economy class pillow, but was still better than the disposable pillows found on most US airlines. IFE: Tons of latest release movies, music, T V shows, classic movies and more. The screen was plenty big, I would guess about 10 inches and kept me more than entertained during my journey. In fact I was slightly upset I slept so much because I was looking forward to watching a few more of the movies! Oh well, it’s a true first world problem! 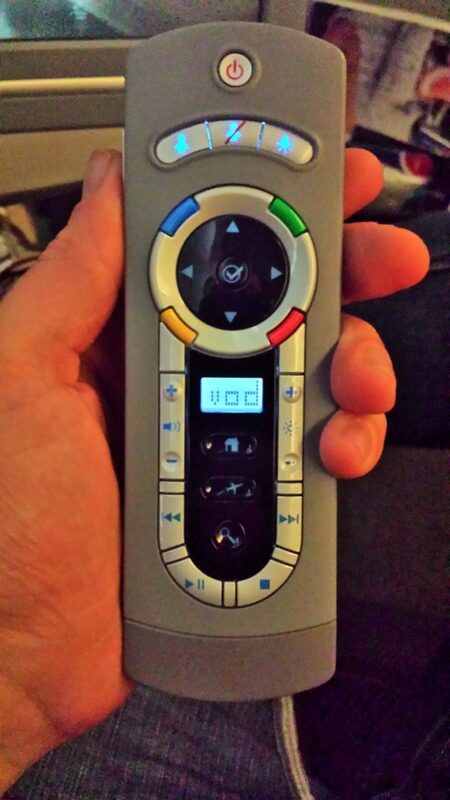 The remote fit comfortably in my hand and tucked away nicely closer to my knees and was out of the way and I never once accidentally bumped it causing the film to pause to stop. Service: Despite sleeping most of the flight I would have to say that the BA FAs were extremely professional friendly and helpful! Even when I was pigging out I didn’t feel like it and when I asked for a refill of something it was done promptly and with a smile! Nothing seemed to be an issue for any of the FAs and they were all smiles the entire length of the flight (or at least when I was awake). 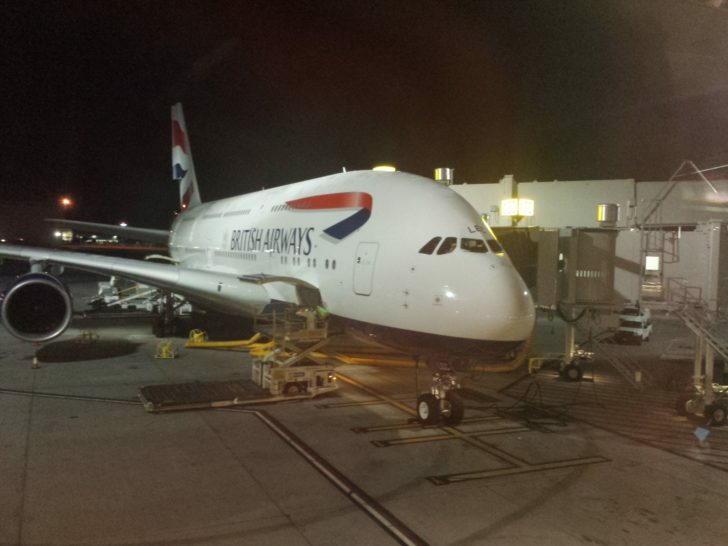 Final thoughts: The A380 is a BEAUTIFUL aircraft. This is the 3rd time I’ve flown this aircraft this year and it’s been more than worth it each time. BA was very creative in their set up and even though it is a HUGE plane, it never feels like you’re in an oversized bird! Each cabin is small and divided into multiple sections making it feel more personal. The staff is extremely courteous and helpful. Over all, I give BA a 10/10, yet again this is my first experience flying World Traveler Plus. I have three more legs on BA, so let’s see how the rest of them go!